The long-standing tradition of Bonfire began on November 18th, 1907 as a burning pile wood and trash meant to welcome the recently-victorious TAMU football team back to town. (I might prefer a “Congratulations!” banner, rather than a smelly pile of burning garbage, as a welcome home present, but that’s just me…) Within a decade Bonfire developed into an annual and much-loved tradition, always burning the night before the TAMU vs. TU football game. 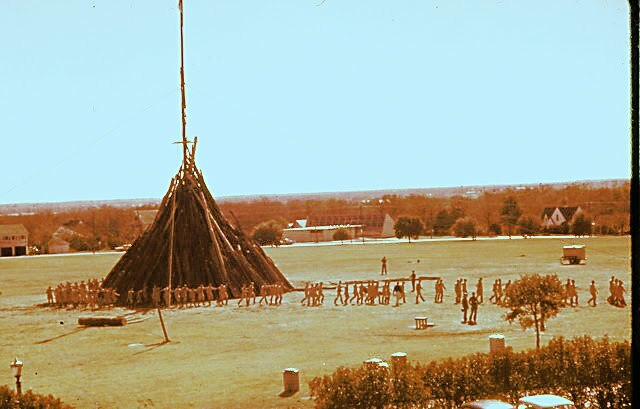 In 1936, Bonfire became a school-sponsored event (TAMU started providing equipment and designating locations for tree removal after farmers complained about their equipment, trees, and even barns “disappearing” in the days leading up to Bonfire), and in 1942, students “upgraded” Bonfire from a pile of wood/debris to a teepee-style structure. This adjustment allowed students to grow Bonfire from around 25 feet to an impressive 109 feet in 1969. 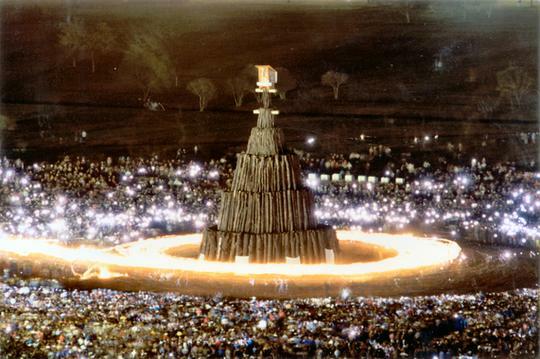 The 1969 Bonfire was the largest bonfire ever constructed and earned itself a place in the 1970 Guiness Book of World Records. In 1978, Bonfire upgraded again, this time from its teepee design to the wedding cake (tiered) design associated with Bonfire today. The structure was built around a central pole, and upper stacks of logs were wedged on top of lower stacks of logs. Members of the Corps built Bonfire until 1965, when serving on the Bonfire leadership team was made available to the general student population. In the years that followed, an elaborate organizational leadership system, led by nine seniors and nine juniors known as “redpots” (they wore red hats), was created. Interestingly, no official documentation associated with the design and building of Bonfire was kept; senior leadership passed their knowledge to junior leadership orally, and when juniors became seniors, they did the same with the new junior leadership. Note: Texas Governer Rick Perry, in addition to being a Yell Leader, was also a redpot. 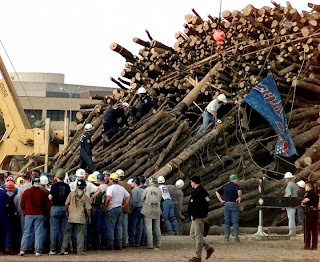 In 1991, Aggie Replant – an environmentally-focused service day, during which students plant trees to replace the ones cut down for Bonfire – began, and the tradition continues today. Most of what has been written about Bonfire at least mentions the safety precautions taken during Bonfire builds and burns. Nearby campus buildings were equipped with rooftop sprinkler systems. Only 70 students were allowed to work on the stack (and by on the stack I mean ON the stack, many stories up in the air, placing and securing logs) at one time, and only students were had been safety-trained could work at the burn site and on the stack. Additionally, both EMTs and volunteer professionals (engineers, machine operators, etc.) were onsite at all times. Since it’s inception in 1907, Bonfire did not burn just twice. The first was in 1963, when Bonfire leadership made the difficult decision to completely dismantle the already-assembled Bonfire to honor President John F. Kennedy after his assassination. Head Yell Leader at the time, Mike Marlowe, was quoted as saying, “It is the most we have and the least we can give.” The second was in 1999, 92 years to the day of the first Bonfire, when the stack collapsed at 2:42am, tragically killing 12 Aggies (11 students and one alumni) and injuring 27 others. After the terrible accident in 1999, Bonfire ceased until 2002, when a student-sponsored coalition constructed an unsanctioned, off-campus student bonfire called the Unity Project. In the 2003 the Unity Project was renamed “Student Bonfire”, and this alternative to the original Bonfire still burns annually during the week before the TAMU vs. TU football game. This year the Student Bonfire will burn on my birthday, and I'm pretty sure checking out this feat of engineering and representation of the Aggie Spirit is what I'd like to do that evening. A powerful memorial was build on the site of the 1999 accident, and on Friday - which is November 18th and the 12th anniversary of the collapse - I will share my experience of and photos from visiting the memorial a few months ago.